Wood is completely carbon-neutral, meaning that the growth of trees and their absorption of carbon dioxide is equal to that which is produced in the manufacturing and transportation of timber, so it has a carbon footprint of zero. Timber has the lowest carbon footprint of any building material. By law many countries stipulate that for every tree which is cut down another has to be planted. Younger trees actually absorb even more carbon than older trees do, so this benefits the environment every time an older tree is cut down for timber cladding and a new one is planted in its place, increasing the amount of CO2 which is absorbed. Not only this, but wood continues to help the environment even after its been felled, as its superb insulating properties when used as timber cladding mean that less fossil fuels are required to heat your home – saving you money! 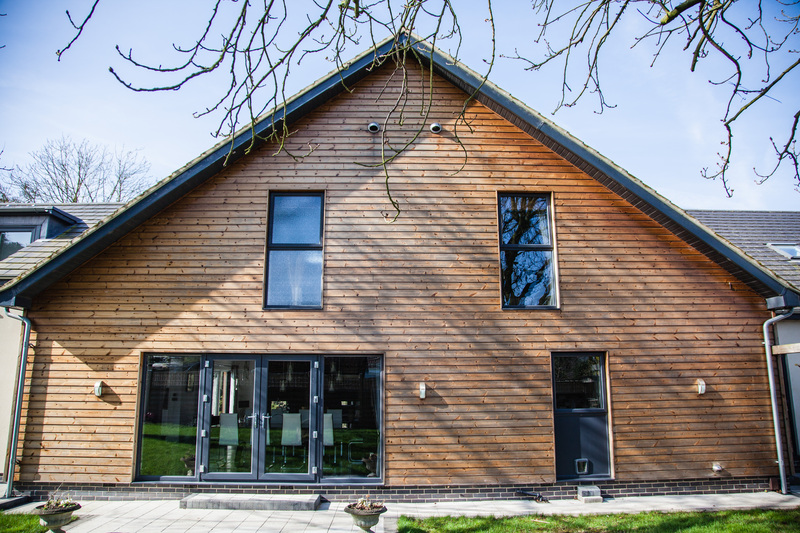 With the outside temperature fluctuating with the seasons and weather conditions, a huge plus of an insulating material such as timber cladding means that it works year round, keeping out the cold in the winter and a pleasant temperature in summer. Another factor is that timber cladding is also highly air tight, reducing the amount of air which escapes from building, preventing damp and locking in heat. There are over 5000 varieties of wood all with different strengths and characteristics, and on top of this a huge range of paints, stains and treatments for timber cladding. You could even paint your home a different colour almost every year. Some woods are great for acoustics, appearance, and structure, while some are light and some are heavy, flexible or sturdy. No matter what your requirements there will definitely be a wood to suit your project needs. Wood can be stained or painted to any colour you like, or with a clear finish to show off its natural colour. It can be cut, carved, nailed or glued and is by far the most versatile of all available materials. As timber is a natural material, timber cladding in particular has a warm and eye-catching appearance, boosting the overall look of any building. The massive range of wood types, cuts and timber grades means that a full spectrum of natural tones can be achieved, with colour changing as the wood weathers and ages, if desired. For examples of beautiful timber, view our portfolio of timber cladding. Considering how light it is – among the lightest of all building materials – wood is also the most sturdy. Wood’s sturdiness means that it can support a building, while its durability means it adapts to changes in conditions and a building’s foundations without causing any cracking, sinking or compromising the structure of the building. For its weight, wood is the strongest of any building material. Its sturdiness allows it to support a building, while its flexibility allows it to adapt to sudden changes or shifts in the foundation without causing cracking. Here at Bennetts Timber we’re proud to stock the very latest in pioneering timber cladding technology – Accoya® and ThermoWood®. Accoya® timber cladding uses a non-toxic aceylation process which changes free hydroxyls that absorb and release moisture in the wood according to changes in climate conditions. This reduces the wood’s ability to absorb moisture and, as a result, makes it virtually rot-proof, more stable and extremely durable. When properly maintained, Accoya® cladding can expect to have a lifespan of 100 years. As all timber has been through exactly the same process it has an excellent consistency throughout the product, meaning less wastage. Find out more about Accoya® timber cladding. ThermoWood® is a modified wood produced by heat treating Scandinavian softwood (either whitewood or redwood) in a kiln at a very high temperature. The heat goes to the core of the wood, drying out any moisture and resin. The result is reduced moisture content of approximately 7-10% and enhanced physical properties, creating a product that is 50% more stable than untreated softwood. This treated timber is ideal for external cladding and other outside uses, with no need for additional treatment. However, it can be easily stained, just as normal planed softwood. It is also very stable and has a high resistance to decay and fungal attack. We have seen an increasing use of ThermoWood® cladding over the past couple of years, as its modified properties are ideal for exterior use. Find out more about ThermoWood®. These are just the latest in a fast developing industry, with new technologies being constantly tested and brought into the market. Timber is a hugely beneficial product which can completely transform a building, while these are just a few of the wealth of reasons that we love timber. Now you know why we love wood so much, why not explore our range or if you want to speak to one of our experts, contact the Bennetts Timber team.